Indonesian Naval Ship KRI Sultan Thaha Syaifuddin and Maritime Patrol Aircraft CN-235 led by Cmde Dafit Santoso arrived at Port Blair, Andaman & Nicobar Islands, India for the Opening Ceremony of the 33rd edition of the India-Indonesia Coordinated Patrol (IND-INDO CORPAT) to be held from 19 Mar to 04 Apr 2019. His Excellarry Ambassador of Indonesia to India, Mr. Shidhar to Raza Suryodipuro is also visiting Port Blair to attend the Opening Ceremony to be held at Port Blair from 20 - 21 Mar 19. The Indian delegation is led by the senior officer from the Indian Navy, Commodore Ashutosh Ridhorkar, VSM Naval Component Commander, Andaman and Nicobar Command. The IND-INDO CORPAT Series of bilaterals seek to underscore India’s peaceful presence and solidarity with friendly Maritime neighbours countries toensure good order in the maritime domain, consolidate interoperability and strengthen existing bonds of friendship between India and Indonesia. 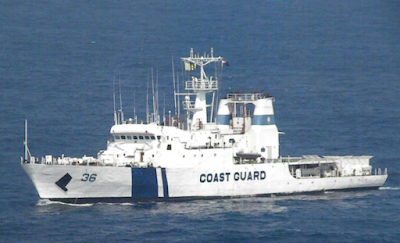 During the stay in Port Blair harbour, various activities such as official calls, formal reception on board ship, sporting fixtures between both navies, ship open to visitors and professional interactions have been planned.